The single track trails of Crothers Woods and the whole Don Valley are more than a secret space I hold dear to my heart. They are a refuge, a place to be whole, a place that is safe. I often worry about the trails, the spread of invasive plants like the dog choking vine is a real threat as well as the scary thought that someday soon ticks may be an unwelcomed visitor to these precious woods. I have spent hours pulling the vine from different spots and freeing tree and bushes choked to near death. Over the many years I have run the trails I have believed firmly in giving back to the forest. Regular trail clean ups and brush removal, like after Wednesday’s wicked winds are a part of being a steward. 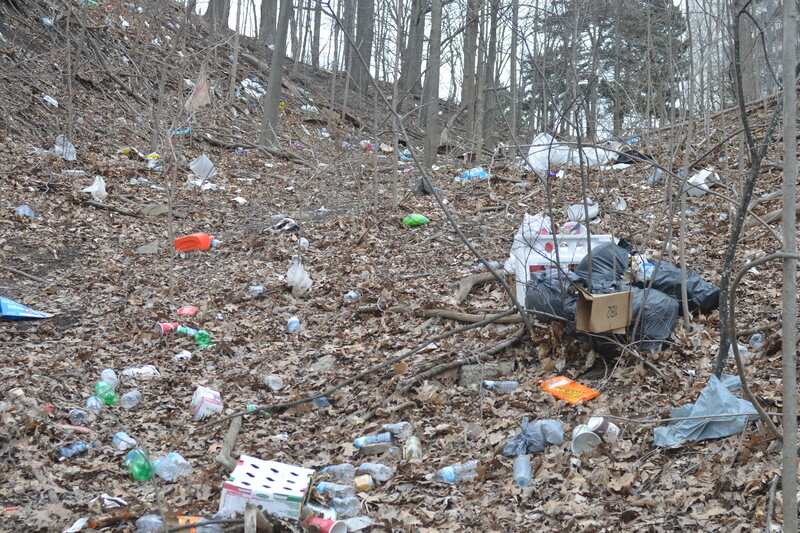 Spring is a challenge for garbage in the city and particularly so in the Don. 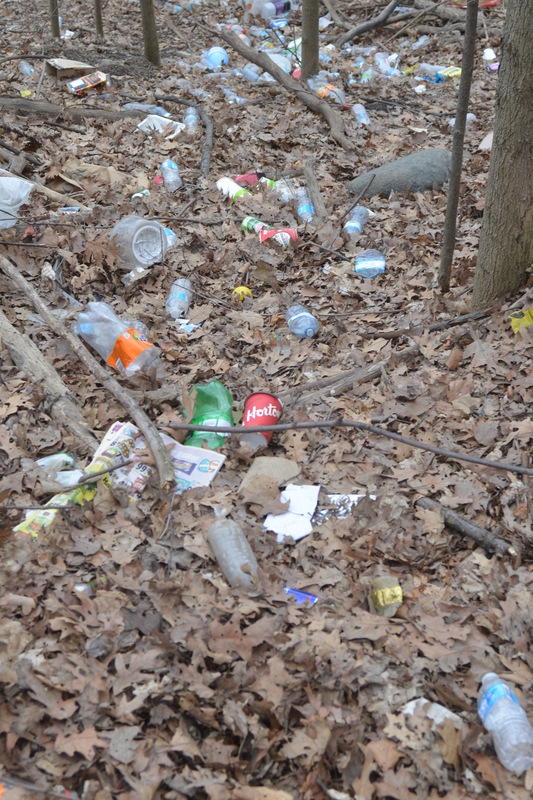 The trees and plants are unfortunate collectors of blown discarded trash. Gravity sends crud from the surrounding neighbourhoods tumbling into to our watershed. Pointing fingers and doing nothing is just complaining and doesn’t move anything forward. I have done five large clean ups this year already. My wife, Nancy and I spent a lot of time cleaning the top of Pottery Road where the road crests near the apartments and the DQ. We are happy to give back. I know many others who do the same. The woods are failing. The trash is becoming insurmountable. The vast garbage shadows created by the apartments that back on to the part known as “ the Ridge”, between the Millwood bridge and the Thorncliffe access road are obscene. Beyond Thorncliffe heading towards the Overlea Bridge is equally disgusting. I have emailed the TRCA and am awaiting an answer. The owners and managers of these apartments have to be held accountable for this pollution as well as the residents who are throwing their trash without thought or care to the effect it has. Of course this can not be every resident or perhaps even most but the number of plastic bags, plastic water bottles, plastic containers, plastic plastics and more plastics is not the careless product of just a few hands. The effort to collect and then carry out by hand is quite hard. I have carried out 14 bags over the past 2 weeks. We can do so much better. We owe this to our city and ourselves. I am not writing this to whine, I will continue to collect and clean. I am not writing to this raise awareness, we know the effects of litter and the damage we do to our ecosystems. We can do better by doing better. P.S. whoever picks up their dog poop and then throws the bag on the trails is a complete knucklehead, just saying. So, yes my post above is somewhat pessimistic and angry. I now add many thanks to a whole bunch of people and I realize I should be more hopeful. Here are a couple more photos of the work ahead. A couple years ago a friend of mine asked me to participate in a FKT for a section of the Bruce trail. I was to run 2 sections. 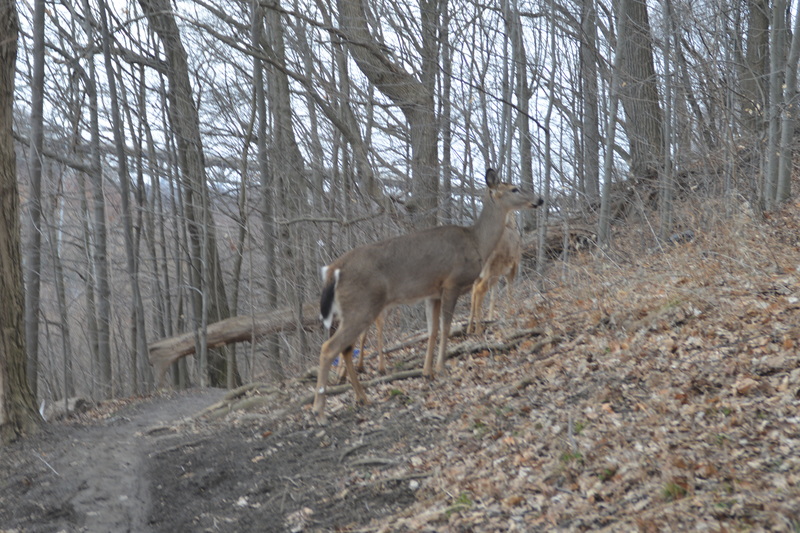 I went early to the first section to scout out the terrain and not having run the Bruce trail in a while, familiarize myself with the blazes again. As I jogged the first bit wondering if I was in the right place and also wondering if I should go grab some food before the run, I passed a young couple sitting by an old stone foundation. A beautiful setting, stones and foliage still glistening from the earlier rain. I nodded and passed by. I scouted out the first 2 K or so and thought that it would be a breeze to complete the distance in the time allotted for this section. I made my way back and the young couple were still there. As I approached they were both beaming with a freshness. The young man, perhaps 28 or so, approached me and asked if I could take their picture. Of course I said. The couple responded by saying that in the few minutes since I had first passed by, the young man had surprised the young lady with a proposal, ” Will you marry me ?”. She had accepted and I was the first to know. The light in their eyes and the absolute joy they exuded was so present. I told them I would be honoured and took several photos of their special moment in the woods. That fall, I was married to my lovely bride, Nancy. We were determined to do our own decorations and I said I had a vision of what we could do with the Lion’s Club hall at Ashbridges Bay. I saw unbleached linen cascading from the ceiling backed by tiny white lights. I saw pumpkins and gourds from my cottage as center pieces. Most of all I saw leaves of bright orange, fiery red and brilliant yellow covering the hanging linen in a beautiful mosaic. The day before the big day, everyone came together to gather the leaves. I knew exactly where we needed to go. 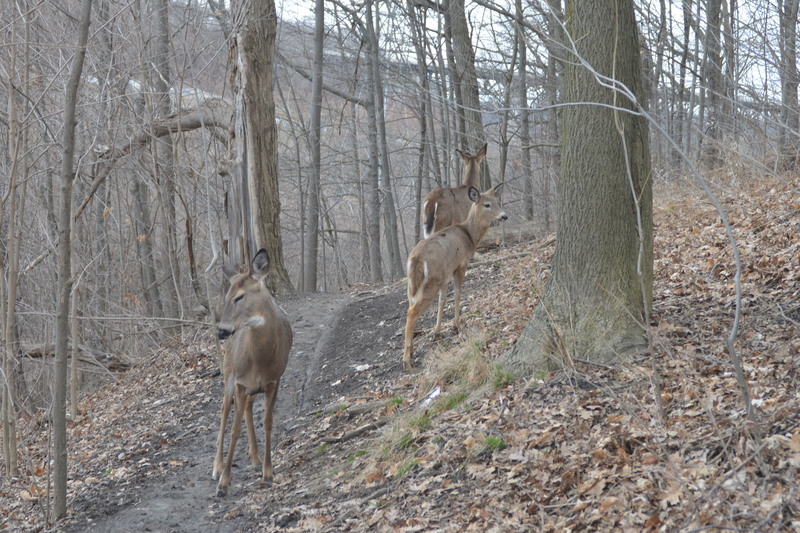 We headed to the single track trails of the Don where I run every day. Two families coming together to join, share and find fallen beauty in the most beautiful place I know. The forest was spectacular, awash in deep crimson, burnt orange and yellows of amber and gold. Carefully applying them to our wedding canopy we created my “vision”. To this day, I am teased about my “vision” and I laugh right along but on that day, just over two years ago, we brought together two people in love, two families, and the trails I love were right there, overhead and sheltering me as always. The autumn is the most beautiful time to run the trails and as I did so yesterday my mind wandered to thoughts of falling in love in the woods, remarkable moments and how truly lucky I am. Footnote: I was born in Toronto, grew up here and lived here all my life. I was raised in the old railway housing in Summerhill. The city is a big part of who I am and why I run. You can see this is in another story. During my year off from regular life I had the incredible opportunity to trail run all over the world. One such place was in the desert on Africa’s Skeleton Coast. 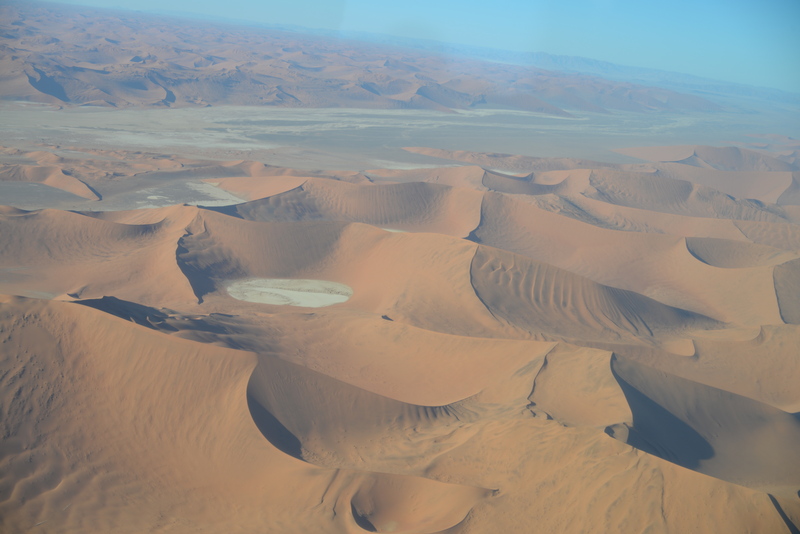 Namibia is amazing country with phenomenal wildlife, vast barren landscape and extremes (see photos below). 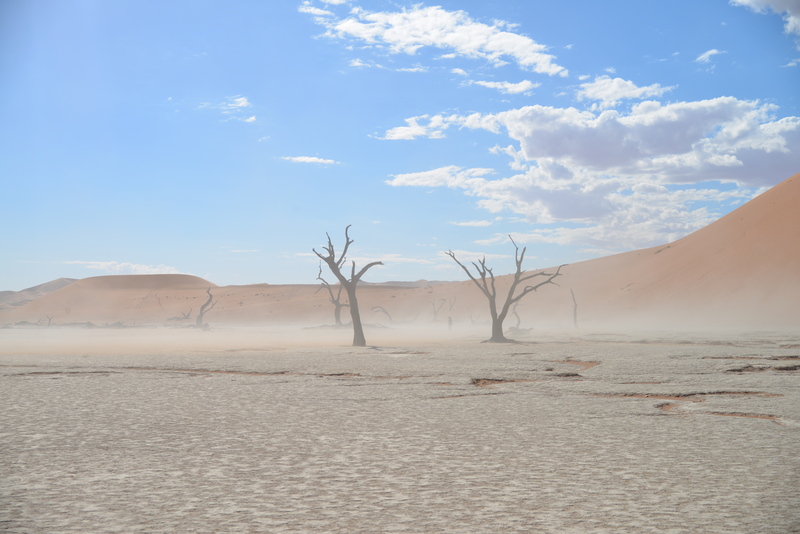 One of the first places we explored was Sossusvlei National Park. 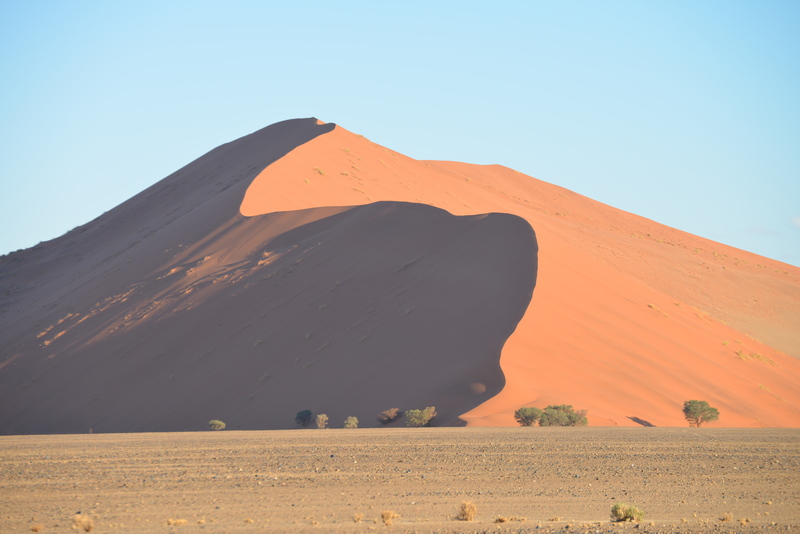 A vast desert with the largest sand dunes in Africa. The sand is multi-coloured but primarily a deep red. 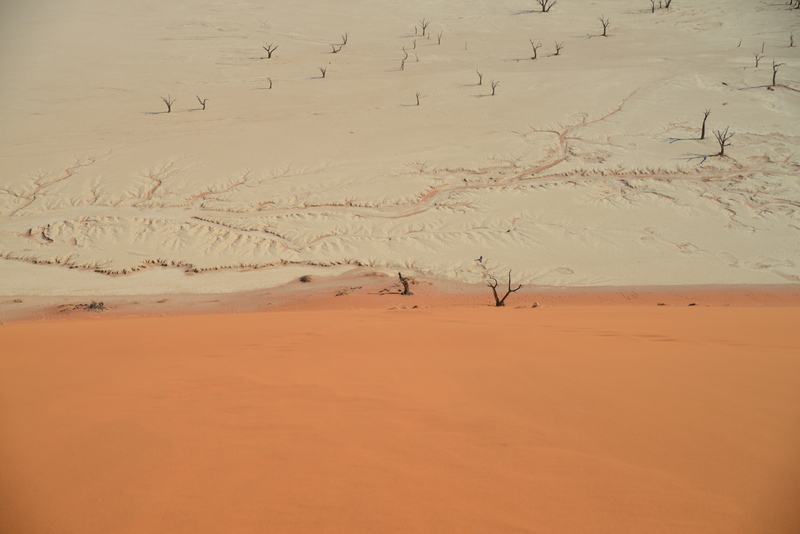 One part of this amazing region is called the Dead Vlei (pronounced flay). A short deep sand drive and then a hike over a few dunes to a landscape which is breathtaking. We wandered through this weird world and me being me , had to run up the big huge dune beside it. I figured, wrongly, that I could zip up the monster in a few minutes, hey it’s like the dunes in Sandbanks near my cottage only slightly bigger. Slightly is the wrong word but that was what I was thinking. I am stupid. Very stupid. I mean running up sand dunes is kinda my thing. My best results have come off long periods of that kind of training. P.S. go to Sandbanks and run the remote dunes, do it, do it often. So up I went and then after a few hundred steps I went plunk. Breathing ridiculously hard and feeling equally moronic I struggled painfully up and up and then a whole bunch more up until the top. I honestly thought, no hyperbole here, that I was in trouble. I couldn’t catch my breath. A few photos later, see below, I crashed and slide back down the dune to my wife, the ever patient Nancy. I mean to be fair, it was eight kazillion degrees and I had missed a few runs and….. ok again fairly stupid am I. Runs in Africa were few and far between. All day in our truck driving through incredible national parks and remote wilderness combined with camping each night in areas surrounded by every kind of amazing animal gave me little opportunity for running. Lots of roaring lions at night, no lie, really. 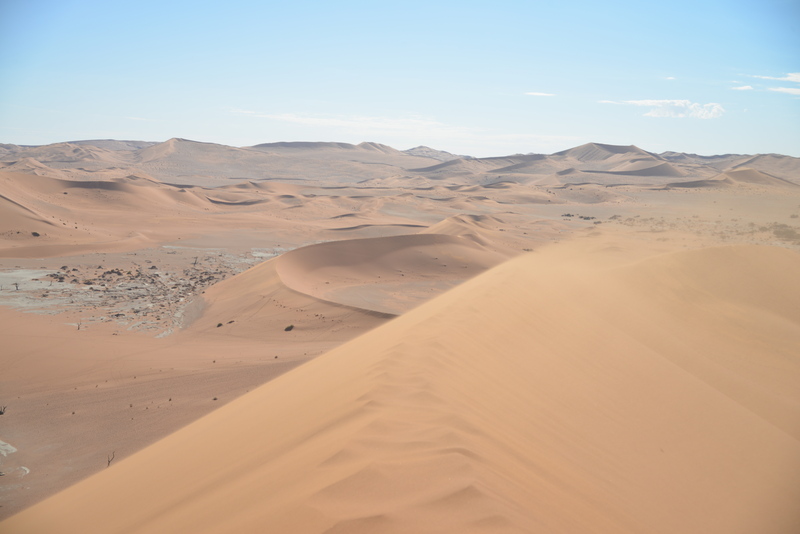 I did get a bunch of runs further up the Skeleton Coast which were spooky and amazing. The YouTube links to 2 videos of the whole messy run. I love the way Nancy encourages me as I am dying and that in one video you hear “told you so”. Also I appear really tiny running because the dune is massive. Also if you watched all of both videos you are amazing because most of the time I am seemingly barely moving. Thanks for your interest, my wife couldn’t sit through all 5 minutes of both and you did.